Russian officials admitted that they no longer can service Russia’s lone aircraft carrier following a recent sinking of a large floating dry dock. Following the sinking of one of the world’s largest dry docks on October 29 in a shipyard in the far northwest part of Russia, officials have finally admitted that they are unable to continue work on Russia’s sole aircraft carrier, the Admiral Kuznetsov, for the time being. While Russia’s shipbuilding industry is reportedly looking into alternatives, no timely and viable solution to continue retrofitting work on the Russian Navy’s flagship has emerged to date. 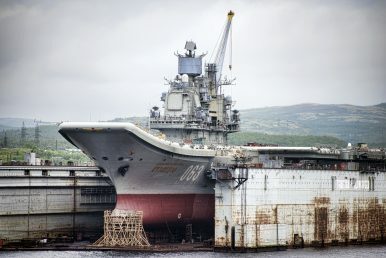 However, the Russian shipbuilding industry does not possess a large enough facility to accommodate the carrier and it will take at least six to 12 months to recover the sunken floating dry dock. According to open source information, Russia would require international support for any such complex recovery operation as it does not possess the equipment to lift the massive drydock from the seabed on its own. While work in the ship’s interior can continue, absent a large floating dry dock, it is unlikely that Russia will be able to keep up with the current overhaul schedule, as all work on the ship’s bilge had to cease. Initially, the carrier was to return to active duty within the next two years. Shorty after the incident, there were reports that Severodvinsk shipyard possesses another floating dock, PD-1, that could be used to continue work on the carrier. However, following an evaluation, it was determined that the facility would not be able to accommodate a warship the size of the Admiral Kuznetsov. The Swedish-made PD-50 drydock reportedly sank when the Admiral Kuznetsov was being pulled out after the failure of a pump system on the night of October 29. As a result of the sinking, a crane fell on the carrier’s deck leaving a hole above the waterline that measures 4 by 5 meters. The accident also injured four workers. The Russian government has set up a commission to investigate the sinking. After the conclusion of the investigation, the commission is set to offer its recommendation whether to recover the PD-50 or look for alternative ways to complete work on the carrier. The Admiral Kuznetsov was commissioned in 1990 and last underwent a two-year refit between 1996 and 1998. The Russian Navy’s 55,000-ton flagship has never been deployed for longer than six months and famously had to be followed by an oceangoing tug boat during all of its sea voyages due to the carrier’s poor reliability and questionable performance during a recent deployment to Syria in 2016. A collapsed crane has reportedly left a gaping hole in Russia’s sole aircraft carrier following the sinking of a floating dry dock.